Polenta is one of those ageless culinary lords, like bread. It has sprung from the hunger of mankind, and without apparent effort has always carried with it a feeling of strength and dignity and well-being. Polenta is an ancient Mediterranean dish. The Greeks, Romans and others who lived in Italy in ancient times made puls by cooking farro, millet and other grains or chestnut flour in water or milk, then added legumes, vegetables, eggs and cheese for a nutritious meal. The dish changed after corn from the Americas was introduced in Europe in the 16th century. Corn cultivation expanded to Italy in the 17th century and was rapidly adopted, especially in the Northern regions. Polenta made with corn became a staple of the lower classes, in part because corn was cheaper than the wheat used for bread, but also because of the sense of satiety it provided. That sense has endured. In the 21st century, my father considers polenta the best food to keep him warm on a cold and rainy winter day. He lives in Italy and has never been to Humboldt County. However, I can imagine him watching our torrential rain and proclaiming: "The right day for polenta." When such a day occurs he traditionally suggests to my mother that she make polenta for lunch. She serves her polenta in wooden bowls that are supposed to keep it warm longer, and seasons each portion with a ladleful ofsugo con le salsicce (tomato and meat sauce with sausages), and finally sprinkles a mix of grated parmigiano and pecorino over all. As a child I relished the leftovers, of which I was the only consumer. Polenta solidifies fast and can be sliced. I would put thick slices on a baking pan and distribute over them thin slices of Swiss cheese, smoked mozzarella or mild caciotta (an Italian cow milk cheese). After removing the collection of lids that are permanently housed in my mother's oven, which always come crushing down noisily when someone dares to open the oven door, I would bake the polenta until it was heated through and the cheese melted. My mother's polenta is excellent in taste and texture. Hence, when I decided to make polenta at home in California, I asked her for her recipe. "Una scodella d'acqua a persona," was her answer: a soup bowl of water per person. "And how much polenta per person?" I understood: she mixes polenta of two different kinds, one finer and one coarser, in the specified ratio. "I know that too. But, how much polenta do you use?" "You check it and if it looks too thin you add a bit more." I took a deep breath and decided to try one more time. "So, how many times do you make polenta with one package?" "E che ne so?" What do I know? During the next conversation I had with my parents, my father told me that if I asked my mother for her recipes I should pay her a consulting fee. One cup of polenta needs four cups of water - something I have not yet told my mother - and serves six people as a side dish. The 1:4 ratio produces a moderately soft polenta easily stirred even towards the end of its cooking time. I use half a cup each of stone-ground cornmeal and polenta, the first finer in texture and the second coarser. Both products are available in the bulk section of the Co-op and of Wildberries, while Murphy's carries packaged Bob's Red Mill polenta. I pour the cold water into the pot and add the cornmeal and polenta with a bit of salt, then use a whisk to mix, while warming up on medium heat. As soon as the water reaches boiling point I turn down the heat to the lowest possible that maintains the simmer and keep whisking until the polenta becomes thick. At this point I switch to a wooden spoon. It takes about 45 minutes for the polenta to cook. During that time I stir quite often to prevent it from sticking to the bottom of the pan, and also to avoid the build-up of steam that results in small volcanic explosions. The polenta is ready when it is smooth, no longer granular. It should slide off the sides of the pot. As I turn off the heat I add at least 1/2 cup of grated parmigiano or other cheese of choice, stir quickly and serve immediately. While I often use parmigiano to finish off polenta, I also like to experiment with other cheeses. For example, I recently used Piave (bought at the Co-op), an aged cheese with a sweet nutty flavor. In the past I have used asiago, taleggio and fontina. Reading a recent column by Joseph Byrd on local cheese makers has put me in the mood of trying Cypress Grove Chevre's Mt. McKinley and Ewe-F-O. The chef at 301 Restaurant in Eureka uses mascarpone to enrich their polenta cake. Whatever the choice, the requirement is that the cheese melts nicely and is evenly distributed. Depending on its consistency, the cheese should be freshly grated or cubed and is always added right before turning off the heat. As I mentioned before, I use at least 1/2 cup of cheese, but usually more, contingent on the accompanying dish. In one variation I add 1/4 cup of diced sun-dried tomatoes five minutes before the polenta is cooked, and then add less cheese. Finally, I add two tablespoons of minced fresh basil leaves. 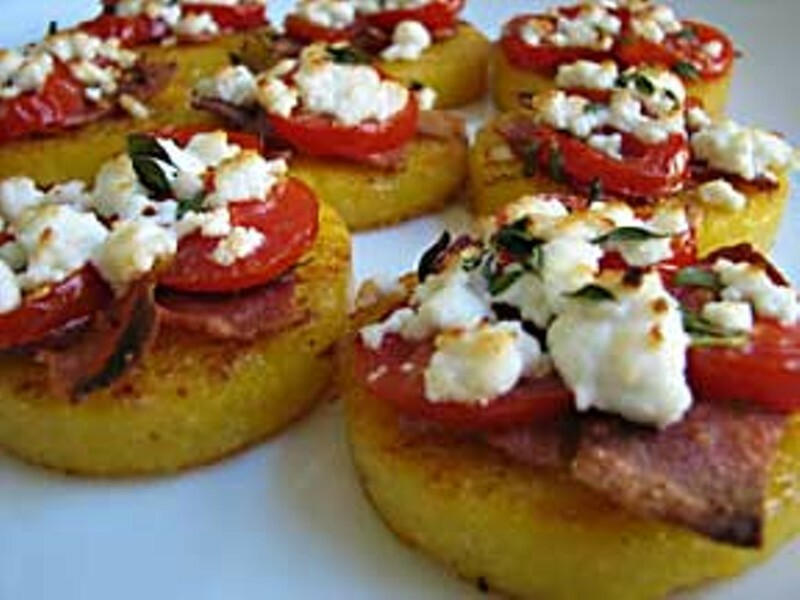 The polenta takes on a nice reddish tone, in addition to the delicious flavor of tomatoes and basil. Another variation entails baking four peeled medium-size carrots and three red beets (cut into quarters), all lightly sprayed with olive oil, at 350 degrees for 40 minutes. I start roasting the vegetables about 15 minutes before I start the polenta, so I have time to cut the vegetables into bite-size pieces before the polenta is ready. I stir in the vegetables after adding the cheese. The result is quite colorful. I store leftover polenta in a cubic container so that it is then easy to cut regularly shaped slices, which can then be grilled or reheated in an oiled pan, or baked (after you remove the pan lids from your oven). 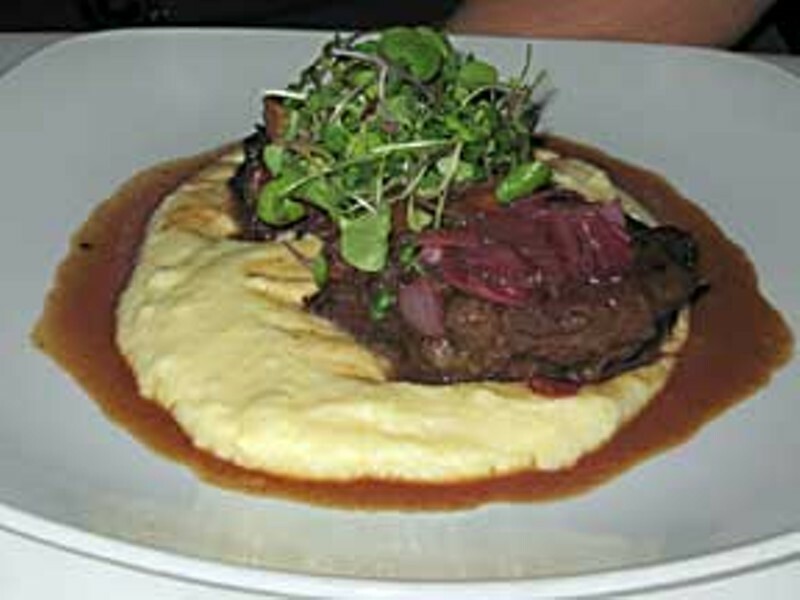 Grilled polenta is featured in the menu of Ferndale restaurant Curley's Grill, as supporting base for a "portabella mushroom tower" or topped with marinara sauce and sausage. 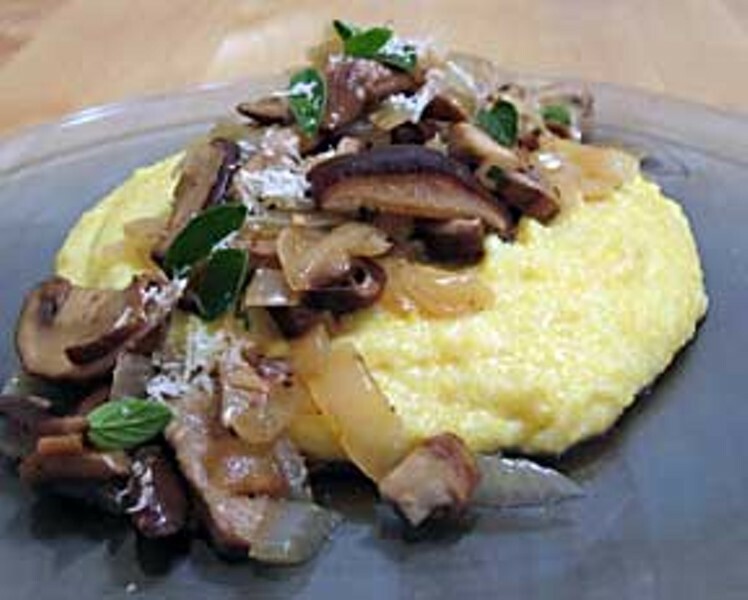 The pairing of polenta with mushroom is my favorite combination. In Northern Italy, polenta is made with cheese and butter and usually served as a side dish to a meat stew. The Arcata restaurant La Trattoriafollows this delightful tradition offering polenta with baked rabbit or chicken, or with beef goulash. What if you do not have 45 minutes to meditate over a pot of bubbling polenta? Option 1 is to use instant polenta. I tasted it once and do not want to encore the experience. Food that carries the modifier "instant" in front is almost always a mockery of the real thing, and I avoid it. The time-saving comes at the expense of flavor and texture, a price I am never willing to pay. When I make polenta for my husband and me, I have a good amount of leftovers, which become my idea of instant polenta. Option 2 is to use the packaged cooked polenta available in many grocery stores. I have never tried it and therefore I shall suspend my judgment. Option 3 is what I would recommend: Cook something else, and make an appointment with yourself for a day in the near future when you will have enough time to prepare polenta. On that day you will spend a pleasant hour watching the slow making of this "ageless culinary lord" and then you will sit down to a meal that will warm both your body and your spirit. Simona Carini is a native of Italy who splits her time between Trinidad and Berkeley.